The inner strengths of the original model are revealed through an uncompromising masterwork. More sophisticated and more contemporary, it stems from a comprehensive approach to formulating the urban expression of today’s active men. Laureato Absolute, Laureato Absolute Chronograph and Laureato Absolute WW.TC, all equipped with Manufacture movements. After bringing Laureato firmly back into the spotlight, Girard-Perregaux orchestrates an evolution of its icon that makes it even more powerful. This piece by Girard-Perregaux is a distillation of watchmaking expertise, enhanced by a broader case middle with tauter lines. 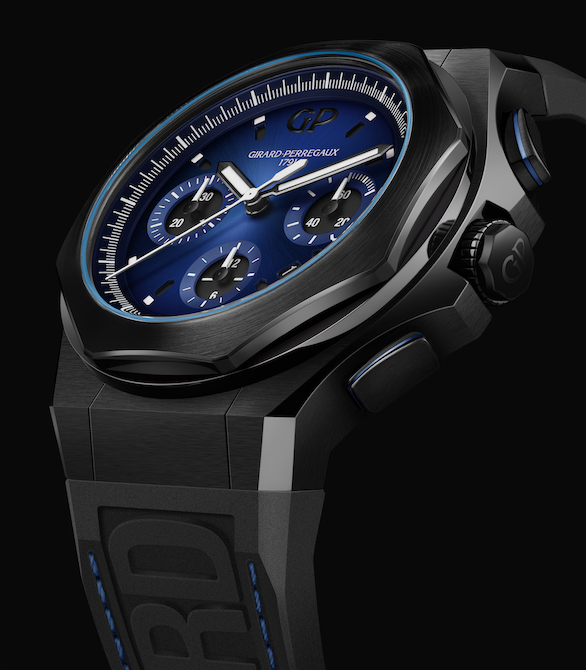 This new structure, entirely clad in black PVD-treated titanium energised by an electric blue ring, is now water-resistant to 300 metres. The white inner bezel ring with its luminescent accents accentuates the depth of the matt black hour- markers. 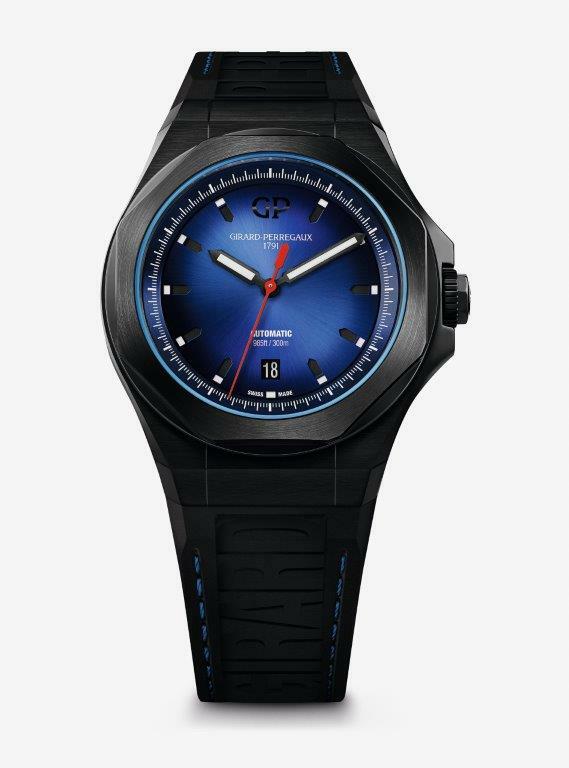 Perfectly integrated with the case, a blue-stitched black rubber strap is injection-moulded with the names Girard and Perregaux, thus affirming its belonging to a Maison of traditions. An inner force that draws its energy from the fundamentals of the cosmos as a quest for the extraordinary, for affirmations of who we are as human beings. In addition, its play on colours, black as the universe, blue as the sky, makes the Laureato Absolute a natural fit within the “Earth to Sky” theme guiding Girard-Perregaux’s 2019 new launches. Finally, Laureato Absolute WW.TC explores one of Girard-Perregaux’s best-known complications: the WW.TC (worldtime) movement. More relevant than ever in a globalised world, this function makes its first-ever appearance in the most avant-garde model from the Maison: Laureato Absolute.